The Cheeky Magpie has some really great projects and free templates. Love her blog. Patent dated 1896. Nice star shaped gift box. This cardboard stick horse patent drawing would make a cute cover for candy canes. Display ideas have always fascinated me and I watch TV and movies for the set decoration. My brain is tuned to business now, still trying to figure out what (or if) my product will be. Are any of you thinking the same? 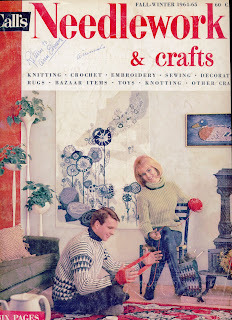 The following 2 pictures are from the 1964-65 Fall Winter McCall's Needlework and Crafts. Display needs to be cool but not so cool that people want to buy the display piece rather than the product. 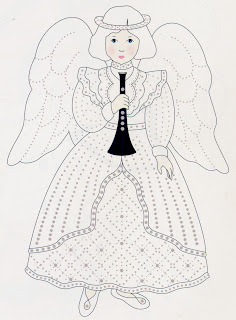 This first pic is of a lifesize paper girl wearing a cloth pinafore. Click the pic for a larger view to study. Don't you think her hair and face look up-to-date today? I think this is a great idea for pattern pictures, craft fair displays etc. 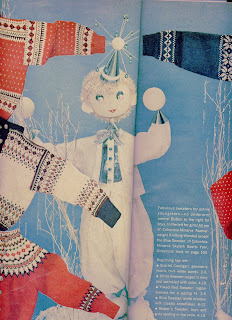 I am fascinated by this winter imp, too. It is made of styrofoam balls, dowel, glittered batting, small christmas balls, silver garland and shiny paper. 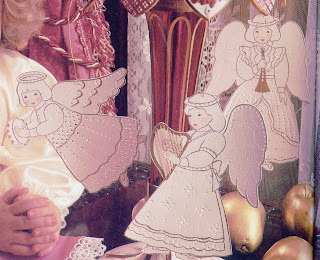 1993 Better Homes and Gardens Christmas Ideas supply these angel ornaments. I would print on brochure weight, watercolor or photo paper (If I had a printer....right now I'm out of luck. Printer died). 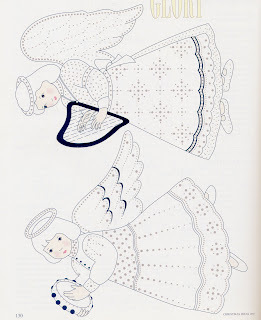 The angels are outlined in gold then pricked with a variety of needles, nails and thumbtacks. Gold cord for hangers and the harp if desired. Click on the pictures for larger versions. This wall piece really caught my eye. Unfortunately, there are no instructions but the leaflet description says that it is done with a full size tissue pattern of the embroidery which is basted to the base fabric then torn away. Click the pics for enlarged images. I love the feel of this little box. 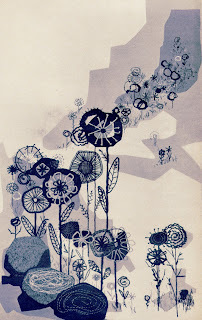 I seem to be interested in paper crafts today. Here is a cute sled pattern by A.F. Lagerstrom from 1902. Clicking the picture will take you to the full patent drawing at Google Patents. The 12 Days of Christmas from a vintage McCalls Jiffy Tree Trims (date unknown). The birds alone caught my fancy. Click the pictures for a high resolution version.